Alas, my long-awaited Italy post is here! Bear with me as I split it into a few different posts all filled with pictures. You can check out the map of where I went here and look for the teal tags. Adesso arriva il mio blog delle mie vacanze in Italia. Ci saranno un paio di post tutte piene di foto. Potete andare a vedere sulla mapa qua dove sono andata trovando i marchi azzurri. Getting to Italy was quite the adventure. The flight my mom and I were supposed to do was SLC-JFK then JFK-MXP. Well, right before we were supposed to land in New York, the pilot announced that we had to circle because there was bad weather. After circling twice in the air, the pilot said that we were going to have to land elsewhere because we were running out of gas and the weather was still bad in New York. Therefore, detour to Connecticut and Bradley International Airport. Once there, we thought we were only going to be there for a half hour. Well, in the meantime, the central FAA computer building caught on fire (small fire, put out instantly), but enough to mess up all flights in/out of the East Coast. This turned what we thought would be a half hour wait at Bradley into a five hour one. Needless to say, we missed our connecting flight. Arrivando in Italia e' stata una avventura. Il volo che dovevamo fare era SLC-JFK poi JFK-MXP. Appena prima di atterare a New York, il pilota ha detto che dovevamo fare un paio di giri perche' c'era brutto tempo a New York. Dopo che avevamo fatto un paio di giri, il pilotta ci ha detto che dovevamo atterrare perche non c'era piu' benzina. Pero' non saremmo atterrati a New York, dovevamo atterrare nel Connecticut. In tanto che aspettavamo, c'era un piccolo incendio alla sede de la FAA dove ci sono tutti i computer che controllano l'aeri. Non era grande l'incendio, pero' ha fatto abastanza per interrompere tutti i voli sulla East Coast. Questo ha cambiato il nostro tempo a Connecticut da mezz'ora fino a cinque ore. Non devo dire che abbiamo perso la coincidenza per la Malpensa. We made the most of our five hour wait with some Dunkin'. Abbiamo trovato un Dunkin e' preso dei donut e caffe'. Once we finally made it to New York 6 hours after we were supposed to, the next step was finding a flight to Italy. We had overheard that the next available flight to Milan wasn't going to be until Sunday (this was Friday) which would put us in Italy on Monday. That wasn't going to work. I had seen a flight for Venice as we were walking to the Delta Lounge to figure things out and thought to ask if they had seats open. They said yes but that we would have to call Delta and have them re-book us onto the flight. After a less than poor experience in the lounge, we found a very nice person that was able to place us on the Venice flight. Therefore, we made it to Italy on Saturday as planned, just a few hours later and in a different city. But luckily for us, Venice is only a few hours away from Parma so it all worked out. Quando siamo poi arrivate a New York sei ore dopo il previsto, dovevamo cercare di arrivare in Italia. Avevamo sentito che il prossimo volo dove c'era posto non era fino a domenica (questo era venerdi'). Io ho visto un volo per Venezia che stava per partire e ho chiesto se c'erano posti; loro hanno detto di si'. Dopo che abbiamo trovato uno molto gentile, lui ha riuscito ha metterci sul volo per Venezia. Meno male che Venezia e' solo ha un paio di ore da Parma. 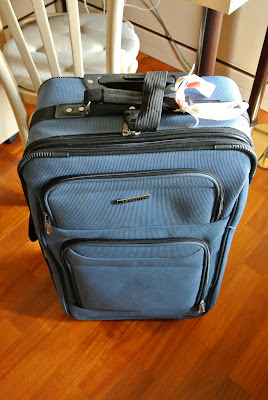 While we made it to Italy on Saturday, our suitcases didn't make it until Tuesday. They obviously didn't make the JFK-Venice flight and then we really aren't sure what happened from there. We had to go shopping (bummer) for some essentials but were quite happy to see our suitcases on Tuesday. Noi siamo arrivate in Italia sabato, pero' le valigie non sono arrivate fino a martedi'. Obviamente, non erano sul volo per Venezia e poi non siamo ben sicure quello che e' successo. Siamo dovute andare a fare un po' di shopping per prendere delle cose, pero' eravamo molto contente di vedere le borse martedi'. There was a Havaianas Outlet in Fidenza - yay!!! While my mom was helping my aunt and my grandmother get dinner ready, my uncle and I headed out for gelato and an aperitivo. We both ordered a Spritz which is the most delicious thing there is. It's 3 parts Aperol, 2 parts Prosecco, and 1 part Soda (optional), garnished with a slice of orange. In tanto che la mamma stava aiutando la zia e la nonna con la ceno, io e lo zio siamo andati a prendere il gelato e a farci un aperitivo. Abbiamo preso uno Spritz che a me piace tantissimo. Then, we went and got some gelato from this new gelateria in Parma. Poi, simao andati a prendere il gelato in una gelateria nuova a Parma. 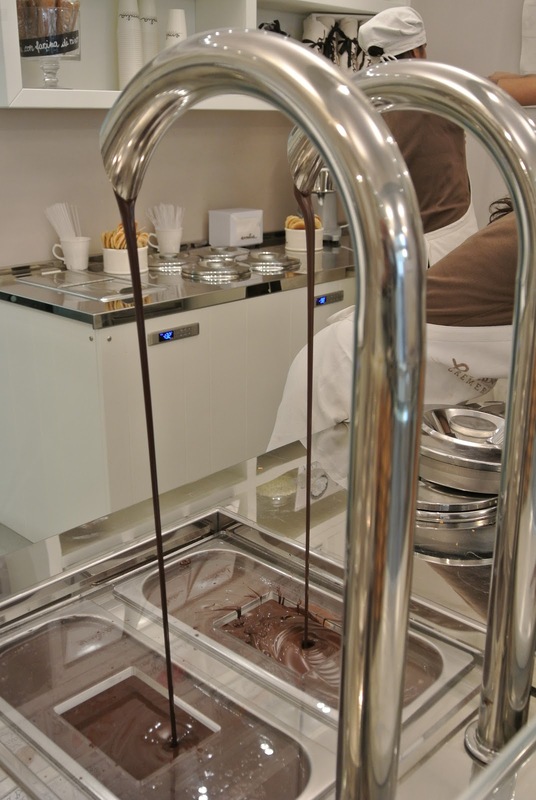 They place chocolate at the bottom of the cone so that the gelato doesn't drip out. This was the primary reason that I had to be in Italy on Saturday. It was the feast of San Giovanni and for that feast in Parma, you eat tortelli d'erbetta, aka, one of my favorite meals. Questo era il motivo perche' io assolutamente dovevo essere in Italia sabato. Era la festa di San Giovanni e si mangiano i tortelli d'erbetta che a me piacciono tantissimo! Obviously, we ate some salame also. One restaurant we ate at had it's patio lined with basil.